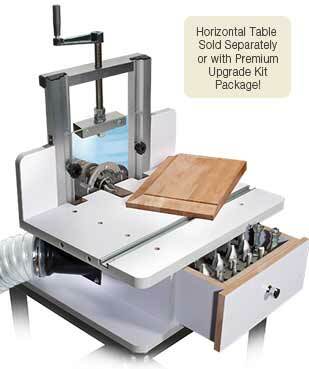 The Premium Upgrade Kit can be added to the original MLCS Horizontal Table! 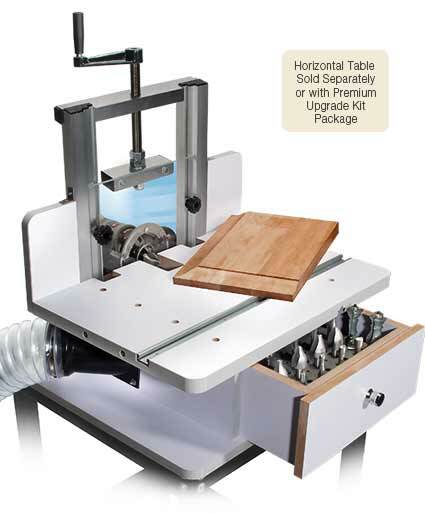 Save $70 with the "Ultimate" Horizontal Router Table System. SAVE $10! Don't stand stock on edge! 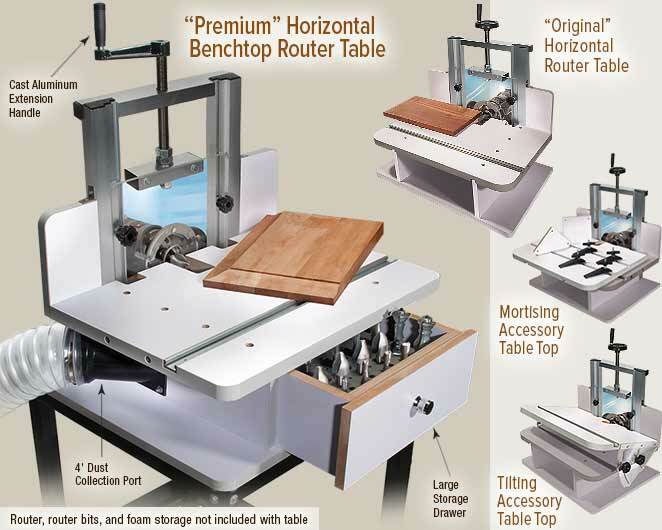 The "Premium" Router Table includes a Cast Aluminum Handle, 4" Dust Port Adaptor and Storage Drawer, improving your routing experience with the benchtop Horizontal Table. See the Premium upgrade kit for more details. The multiple routing operation benchtop Horizontal Router Table makes tall auxiliary fences, multiple featherboards or jigs UNNECESSARY. Full extruded aluminum router lifting support structure for additional stability! Quickly and easily make mortise & tenon joinery, raised panels with vertical raised panel bits, moldings and picture frames. Features micro adjustable bit height adjustments. 1/16" per turn allows for very precise adjustments: (1/4 turn = 1/64", 1/2 turn = 1/32", 3/4 turn = 3/64"). The table is 24" wide x 20" deep x 25" high with a sturdy 3/4" thick MDF core, durable melamine surface and polyethylene plastic edges. 3/4" thick MDF core with melamine surface extension fences, on both sides of the router plate give maximum support to long stock. 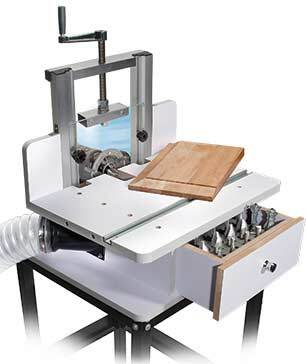 The 3/8" thick, 11‑3/4" x 11‑1/2" clear acrylic router plate is held in routing position by sturdy aluminum extrusions, along with two locking knobs which safely secure the sliding router plate in position. The Miter T-track is designed to accept MLCS accessory Titlting Table Top and Mortising Table Top. Use with 3 HP routers or less. Raise or lower your router up to 2-1/8" below or 2-3/8" above the table. Raised Panel Door Instructions included! NOTE: Router and router bit are not included. SAVE $10! With cast aluminum handle, 4" dust collection port, and large storage drawer. More details. List $259.95. Our classic table with a standard handle. Does not include the dust port or drawer. We gave this table a four star rating because of the fit and finish of the table. Everything seems to work well with little adjustment out of the box; of course, you have to assemble it before you can use it. Our biggest surprise was discovering there is no mounting device related to this table — thus, the table relies entirely on the routers base plate for mounting. In the process of assembling the table, before you install the Acrylic Router Mounting Plate, you must take the router's factory mounting plate off from the router and center it over the hole in said Acrylic Router Mounting Plate, mark where you want to drill holes for mounting your router. After you have mounted your router's base plate to the table you can then complete the table assembly. Respectively, if you are planning to use a router motor that does not have a base plate, you will have to design a strong stable mounting bracket to hold your router motor in place on the Horizontal Routing Table. Also, if your router does not have a quick release lever that lets your router slip out of its mounting base, that can also be a problem. The bottom line: the cost of this product balanced with the functionality of it for the purpose it is intended, is a good match and we are pleased with our purchase and with the after purchase support we received. Happy with this unit as with all products I've gotten over the years from MLCS. Only "grump" is the adjusting screw is hard to turn. Fit, finish alignment etc are all spot on for me. first the location of the router plate hold down knobs was not well thought out. I moved the bottom two holes up about 2.5-3 inches. Counter sunk the holes using 1/4-20 slotted nuts and flat head phillips machine bolts instead. Directions could have been better but worked out ok.
Mortising table T-slots won't accept the larger t-bolts from some other makers clamps/hold downs but a little filing I made them fit. I like the drawer but it will fall out if not careful. Will change that. I have run 194 feet of door casting molding through the table and it works great. I am a cooper and have custom bits to round over staves for the barrels. This horizontal table makes it a breeze to get an even cut. Easy to put together, very sturdy, well worth the money. I bought this product in Australia and, miraculously, paid less for it than it costs in the USA. That's a first!!! Set up is pretty straightforward if you take your time. The perspex router base mounting plate is solid, but it doesn't quite fit flush with the aluminum supports. The manual suggests adding shims in the form of tape to allow the two edges to marry up. It required about ten strips of masking tape to achieve a flush surface, so I would suggest that either the perspex base needs to be slightly thicker, or the rebates on the aluminum extrusions need to be re-machined (made less deep), to prevent this happening. Otherwise, it works very well. The fence and router assembly sit perfectly square to the base. The pre-drilled holes align perfectly. Everything (bar two very tiny screws) was included. A six inch piece of the plastic edge banding on the table had come loose, and broke off during assembly, but this won't affect the way the table works. Just a few other design issues: You cannot easily attach feather-boards to the fence. There is no track provided, and the knobs holding the router assembly plate get in the way, preventing you from running stock that's more than about 5 inches high over the blade. So this horizontal table isn't a worthy substitute for a regular router table. And finally.... I would suggest finding a suitable (perhaps 2nd hand) router to leave in this table if you are going to be using the set-up frequently, as it's a pain to keep having to remove and reinstall the router whenever it's required. I am using a 2400 w Makita 3600BR (circa about 1986) and I intend to leave it mounted in the table. There are not many of these horizontal tables available commercially (not in Australia, anyway). I would recommend this product. It does what it promises to do pretty well. BTW, Australia is not on the pull down list of countries provided, but I can assure you, we are still around! The table was easy to assemble and the assembly directions were among the most accurate I have used. The table itself is well made and well machined. I used the machine to construct a sliding dovetail in a table leg and skirt board with excellent results. The only downside was a need for some shims to bring the router plate flush with uprights and fence. Masking tape works but shims would be much more professional. This was one of the best tools I have ever aquired. It performed flawlessly for some moulding I needed to make. I recommend it highly to any woodworker. I have to agree with the previous reviews to some degree, but it was obvious to me that MLCS had made an effort to correct some of the previous shortcomings the table had. First of all the wooden block that attaches to the plexiglas router plate is now pre-drilled even though the instructions to drill it yourself are still included. Unfortunately, this does not improve the smoothness of operation when raising or lowering the router. Don't misunderstand me, it works, but not with the smoothness you'd like to have. I believe both wooden pieces should be replaced with metal, providing more precise alignment. I had no problems with the directions, probably because they were written in this country and not China. Years of trying to understand translated Chinese directions, made using the ones from MLCS a snap! Let's talk about dust collection for a minute. In the on-line video the entire table is dropped into a recess built into the bench and this recess contains the dust collection system. Not feasible for those of us who don't want to build a new bench or seriously rebuild an existing one. Sealing up the rear of the table looked like a difficult proposition to me, so I chose to build a fixture that slides into the front opening under the table with a 4" hose connection. Easy enough to build, but it doesn't address blocking off the lower opening in the rear under the router plate. To accomplish this I cut a piece of scrap 1/8" plexiglas to fit the opening side to side and somewhat lower than the motor of the router will ever have to go. Then I cut slots that corresponded with the lower router plate bolts so the router plate could be adjusted up and down, while my "lower rear seal plate" could remain in place. It works fine and the 4" hose coming out the front is no problem to operation. MLCS might give this method some thought and provide some other hose attachment method, as I feel dust collection is an important part of most shop operations. With all this said, being able to run various projects over a horizontal router is a vast improvement in safety and convenience, take it from a guy with a couple chewed up fingers to prove it. I just got a MLCS Horizontal Router Table. In summary, what I got was a kit. If you want to just screw it together and get to work it ain't happening. The alignment of everything is close but not close enough for wood working. You will find the mounting block to far forward so it pushes the router plate to far forward. You will find it impossible to get a smooth up and down travel on the router plate. The bolts bind in the tracks because the router plate holes don't align with the tracks the hold down bolts ride in. I'm thinking about drilling the pre-drilled holes in the router plate a little larger to give the bolts a little more slack to release some of the binding. And trust me, I worked hard to get the holes on the router plate to align with the tracks in the aluminum posts. Don't get me wrong here. I am not trying to get the router plate to travel with the smoothness of a fine machined part. I just don't want to have to fight with it to get the router plate travel to work. You will find (and this is the most important) the router plate is not flush with the horizontal pieces your work rests on. You cannot use a tool like this when the relationship to the bit is not 90 degrees to the surfaces you ride the wood on. Plan on spending time shimming to get this accomplished. The extruded aluminum is not to spec with the router plate or the plate is not to spec with the extruded aluminum. So -you will be shimming the router plate to be even with the face of the extruded aluminium. However, once you have your DIY kit together and shimmed and tweaked properly so everything aligns as needed - IT WORKS. I like having a horizontal router. However I don't think all the trouble I went through to get it together properly was worth the cost. Some simple QA checks during the manufacture of this product would make it a very good product. Please MLCS add these to your QA checks during manufacture. 1 - make the runner on the extruded aluminum the same depth as the thickness of the router plate. Or if you already purchased a bunch of them, purchase router plates that match the depth of the extruded aluminum track. You could also just add a roll of UHMW (ultra-high molecular weight) tape to the kit. This would allow us to shim easier since it is definitely going to have to be done. 2 - Make the router plate mounting block line up with the bottom of the track on the aluminum posts the router plate rides on. The above 2 QA checks will ensure the surfaces relate 90 degrees to the bit. Which if you just make sure that happens then you will have a very good product. I have found that ordering with MLCS to be very easy, fast and efficient. And if you have any questions, they are there to answer on the spot. Before this purchase, I have found MLCS products to be of great quality and great price. Thats why I was a little let down with this router table (stay with me). When this table was shipped, it had all of the parts and instructions needed. The instructions were not the best and need some clarification. When it came time to drill the holes in the wood support that raises and lowers the router plexi, it did not tell you what to orient it to. I picked by setting the threaded rod perpendicular to the top wood plate. When after drilling the wholes the threaded rod was really out of line to have it raise and lower smoothly (they do give you a template, but do not recommend using it. The reason is, if the threaded shaft is out of line like mine was, you will be drilling the holes in the wrong location. This will ensure correct location evertime no matter if the thread rod is perfect or not). You should dry fit everything with the plexi in place, make sure the threaded rod is perpendicular to the top plate. Clamp the plexi to the lower wooden block, mark the holes and drill. This will ensure that the unit works like it should. I called the help line and ask what I should do and they were very willing to have me send it back and they would send me a new one. The second issue I had was that the plexi that holds the router was 3/32" thinner on the out feed side. It doesn't sound like a lot, but your work piece will hit the aluminum extrusion and cause your work to stop. Very dangerous and scary. Solution, layer tape between the aluminum and plexi till you achieve desired level. Great? No, but it works and have not had a problem with it. Mlcs told me (and I agree) that it is hard to regulate manufacturing of this type of product. That was about it for the issues. The table is nice and flat and it really makes nice panel doors safetly! I love this table! I would recommend it to anyone! 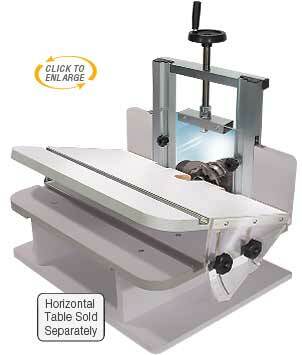 Note: The Horizontal Router Table cannot be used to make arched doors. 1) Start by cutting your panel to its finished size. You may choose to allow a small 1/16" to 1/8" gap inside the rail & stile for seasonal wood movement. 2) After you have cut your panel to its finished dimension, install a vertical raised panel bit in your router. 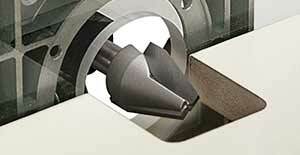 the router bit's edge is just above the surface of the tabletop. Turn the locking knobs to secure the router and plate in place. 4) Turn on the router and working from left to right, make the first pass on the end grain of the panel. Cut the end grain first so that any tear out can be cleaned up when you cut with the grain. 5) After cutting the end grain on the panel, cut the two remaining edges (with grain cuts). 6) Turn off the router and wait for the router bit to come to a complete stop. 7) Loosen the two locking knobs on the router plate and adjust the bit up a small amount. Lock the knobs to secure the plate and make your second pass on the panel. 8) Repeat until you have a 1/4" tongue to fit into the slot on the rails and stiles. TIP: Taking many shallow passes will yield a better cut than trying to cut too aggressively which may lead to a poor cut quality or excessive tear-out. 9) Remember Safety Rules: Wear proper eye protection, keep hands away from router bit and never rout with the router bit above your workpiece - always keep your workpiece above the router bit. When using bits taller than 2-1/8", the router table opening must be enlarged. A safer, easier, and accurate way to cut mortise and tenon joinery! NEW! Improved Stability. An accessory for the Horizontal Router Table. Note that the Horizontal Table is sold separately except for Combo Package at right. 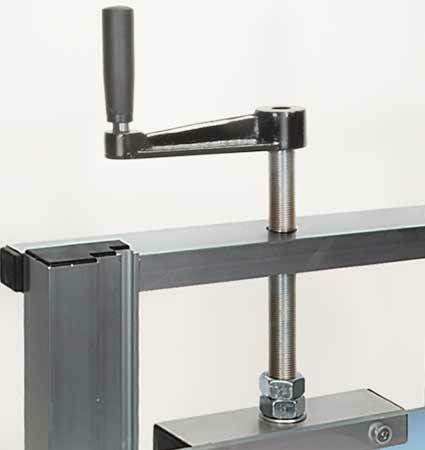 The mortising top slides X-Y on aluminum t‑tracks to insure straight, accurate cuts. NOTE: Older style Horizontal Tables will require the installation of a miter t-track (MLCS #9871) into the existing table top. The way it fits right on top of the existing table is pretty slick. Moves very nicely all around. If you need to do mortise cuts in 2 inch table legs....forget it. You will need to make your own mods in ordear to hold the piece which defeats the entire purpose of this. Did they not realize people make mortise cuts on table legs? I bought this thinking it would simplify and make the process safer. I was wrong about the simplify part. For this amount of money, this should not be an issue. Another rail needs to be added in order to hold smaller stock. Very disappointed with this purchase overall. I also fixed the tipping problem mentioned in another review by attaching two wood strips using double sided tape. I had two other issues to overcome. First, the hold down clamps are not long enough to hold a board 2" wide against the front edge of the top. I made longer pieces using scrap maple pieces to fix that problem. Second, the 'T' channels are screwed to the MDF top with wood screws. The screws pulled out of the MDF when I used enough torque on the hold-downs to secure my work piece. I fixed that by drilling all the way through the sliding top and counter-bored the bottom side to accommodate #8 nuts. I had to get machine screws long enough to go through the MDF top. In essence, the channel is now bolted to the sliding top. I also secured 150 grit pieces of sandpaper to the sliding top near the front edge to keep my work pieces from slipping. I like this accessory very much and think MLCS should consider modifications to the design to overcome these issues. Works great. However the top mortising table can tip down against the bottom table surface near the edge where the router bit is cutting. If there is downward pressure applied to the work piece near the front of the mortising table, it can drop about 0.20 in. This is caused by the xy T-track assembly that is between the bottom table and the top mortising table. I solved this problem by gluing two plastic guides underneath the mortising table on each side of the table and near the edge where the router is located. No more tipping. The ultimate flexibility in routing! An accessory for the Horizontal Router Table. 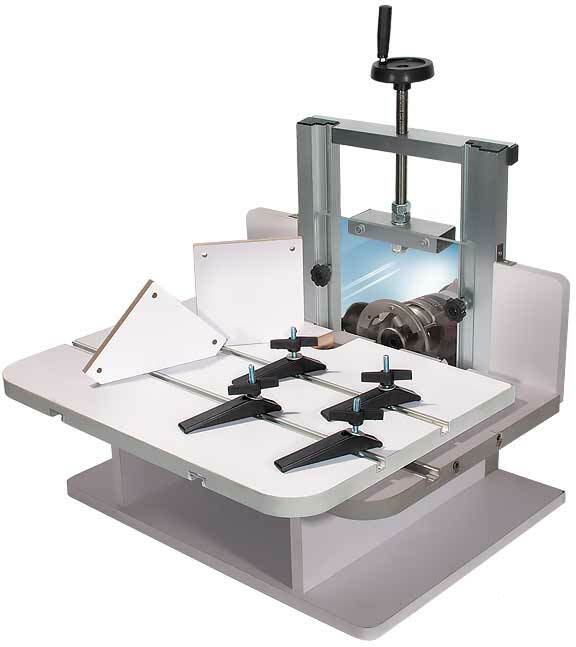 The table top tilts up to 45°, allowing you to create offset angles that can't be cut on a conventional 90° table surface. Note that the Horizontal Table is sold separately except for Combo Package. NOTE: Older Horizontal Tables will require the installation of four threaded inserts to use this accessory table. My unit came with the frame, plastic router plate and side wings all in different planes. I overcame this by building a tall auxiliary vertical fence that extends across all of them. Also built a second auxiliary horizontal sliding table with movable guides and a hold-down clamp. (Pity photos can't be included.) After these modifications, the table works very well for making mortises, tenons, and a wealth of other joinery. Works very well can do some odd cuts with it.Had a little problem with the top when i received it. That being said customer service was very responsive. Excellent quality and functions. I converted the board to include the sliding table features (added t-tracks, slides etc.). This was done to save space..the sliding table package at 80.00 is a good value, I spent more in converting mine! but saved in more items to store! MCLS should consider this all in one option. 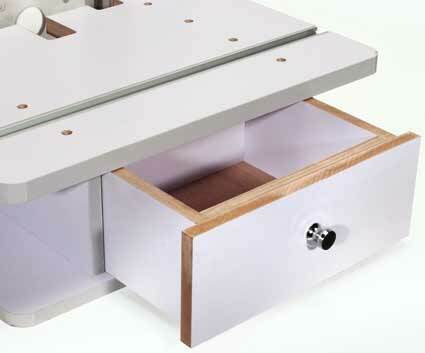 The Premium Upgrade Kit includes a new Handle, Dust Port Adaptor and Storage Drawer, improving your routing experience with the MLCS Horizontal Table. The Horizontal Table is sold separately except for Combo Package #9761. The Cast aluminum extension handle makes height adjustments even easier. By adding this extra strong and extra long handle, the force required to make precision adjustments is much less then the original stock handwheel. The premium upgrade kit includes everything you need to enclose the base of your horizontal table and make it dust collection ready. 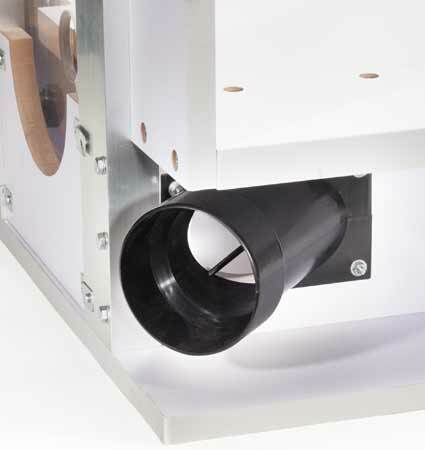 A 4" dust collection adaptor mounts to the side of the table. A back panel encloses the dust collection area and still allows for all height adjustments to be made. A large storage drawer has been added to the front of the table, with enough room to hold a large selection of router bits and router accessories. Keeping everything you need within the table improves organization and saves time. The Premium Upgrade Kit can be added to any MLCS Horizontal Table by just drilling a few holes, and replacing a few parts. Installation is fast and easy! Horizontal Table sold separately or with #9761. I will start off by saying that the overall idea is great. I love the way the sliding top just fits right on top of the existing table. However, the dust collection is almost useless. There seems to be more chips and dust going outside the table than into the dust collector. To call this an upgrade is a lie IMO. For the money it is well worth it. It all matches the unit the dust collector connector works well with my system.